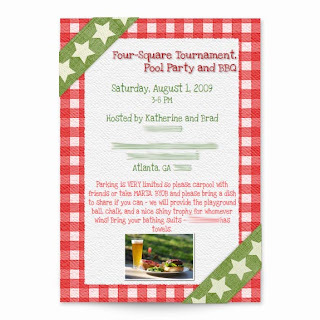 Always looking to have a fun get-together at my condo, I decided recently (after a brainstorm with my creative uncle haha) that the next party's theme would be Four Square! Have you played Four Square before? Four Square was HUGE at my elementary school. We're talking painted boxes on the playground, lines of 30 kids waiting to get their turn, and the inevitable few kids that ruled the Box. Ok so since it's summer, I am pairing this fun event for my friends with a potluck style BBQ and pool party at my condo. To invite everyone, I am using a fun site called MyPunchbowl. I LOVE this site. It's like Evite - but with more customizable features that appeal to me. 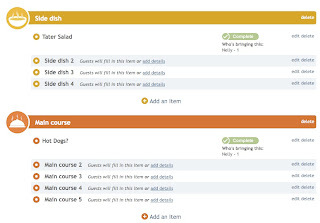 For instance, you can make a whole Pot Luck list and let people sign up for things or fill out what else they might bring (see above). AND they let people receive this uber-cute fake invite in the "mail" - way cuter than a basic Evite, I think. Check out the cute picnic border I got to use! And customizable fonts, etc. They also let you add in extra notes in a sidebar that appears with the invite when opened. That is helpful for me to detail out parking even more, which is always limited downtown. More to come about the party soon - its this weekend, time to prep!